I know. Cheesy title for a post about my birthday. But this Beatles fan just can’t help it. The great thing about having a Sunday birthday this year is that I was able to turn it into a weekend affair. I’ll admit, I was a little worried about how the celebrations would go. I usually like to go home and spend the day with my mom. I mean, she’s the one who did all the work 25 years ago. I just showed up and ate a lot. But these past two days have turned out to be the next best thing. Another great thing about the timing of this year’s birthday is that I still have a ton of gift certificates leftover from Christmas. So while I got some cash for my actual birthday, I was able to redeem those gift certificates for something a little more tangible. I also redeemed a gift certificate at my running store. Thanks to some stellar sales and my sweet staff discount, I was able to buy two long-sleeve technical shirts, a pair of Nike capris, a running bra and running socks for only 80 bucks. That’s ridiculous. I scored one of the shirts and capris for six dollars each. My mom actually bought me one for Christmas to go with my new 50mm lens, but we ended up returning it. She gave me the money to buy another one here in Toronto and I’m so excited to play around with it! It’s only about a foot tall with bendable legs. So I can put it on the table or wrap it around things to capture a clear shot. Such as a picture of this week’s Simply Switch. That would be switching out my usual cheap, processed, store-bought bread with homemade Irish brown soda bread. I polished off a whole loaf in less than a week! 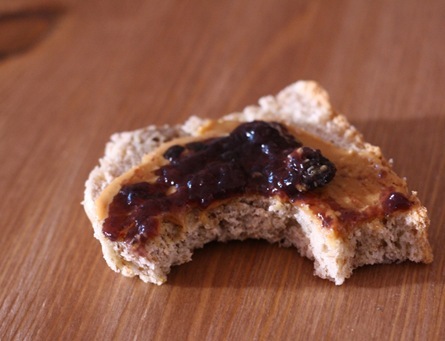 SO good with a little PB&J. No yeast required. If I can do it, trust me, you can too. I decided there was no better day than my birthday to try out this nifty contraption me and 99 other people won from Janetha’s blog. 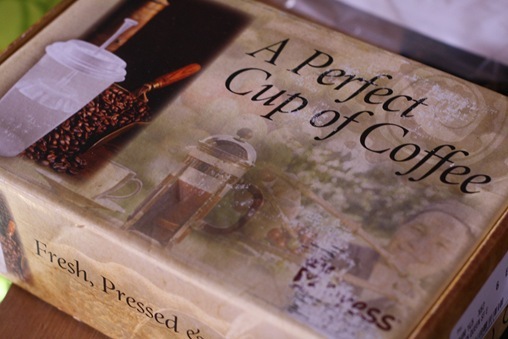 It’s a box of XPress Smart Cups. For people (like me!) who need to French press on the go. I’ve got an hour-long commute to work, so I often end up drinking my coffee on the subway. Or today, to keep me warm while walking in –28 C (-18 F) weather. 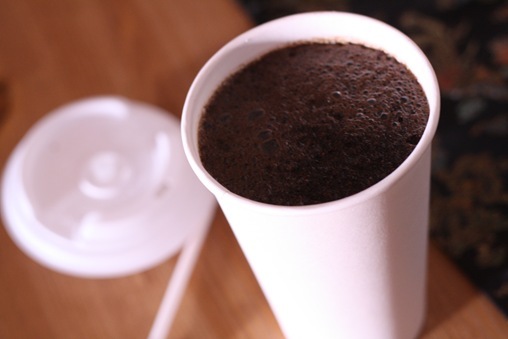 All you do is mix your near-boiling water with coarse coffee grinds (I use 3-4 tablespoons as I like it strong). 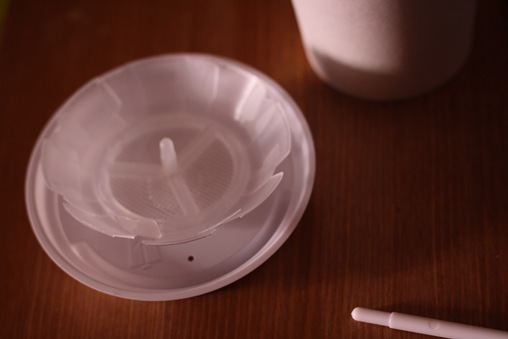 The lid has a disposable filter built in. Put it on and let the coffee set for four minutes, then take the small plunger and push the filter down. Voila! As a person who is chronically late, this saves me from being an extra 5 minutes late while I wait for my coffee to brew. Such a cute idea! However, today was a much more relaxed affair. I booked the day off both jobs. Birthdays are an automatic “personal day” ;) I sipped my coffee on the way to a birthday brunch! 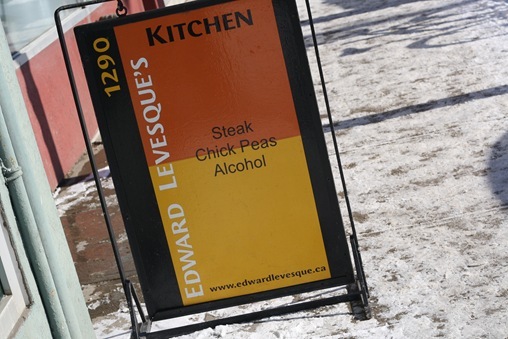 Continuing with the Leslieville Brunch Tour, my friends and I decided Edward Levesque’s Kitchen should be next on the list. I don’t know why we didn’t come here sooner. Their brunch menu is one of the most unique I’ve seen so far! Crazy, right? 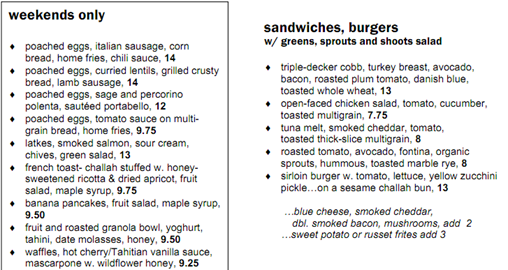 In any other circumstances, I probably would have gone for the challah french toast. But my hangover was starting to set in and it was asking for a greasy savoury meal. 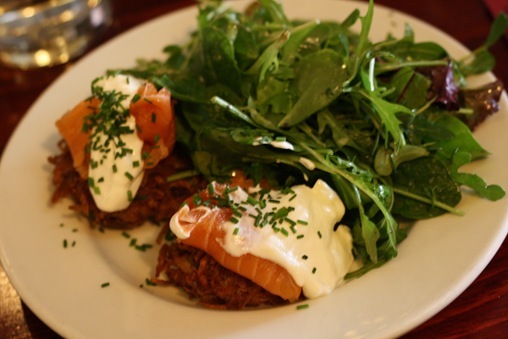 So I went for the latkes, smoked salmon, sour cream, chives, green salad. Loved. I mean, it’s hard to screw up fried potato pancakes. But the smoked salmon and sour cream on top made them a million times better. I also appreciated the mass of greens on the side that for once were lightly dressed and not sopping in oil. Roommie Megan went for the cumbrae grilled jerk skirt steak, grilled pita, avocado, two over easy, roasted tomato, chives, olive oil. This looked SO good. 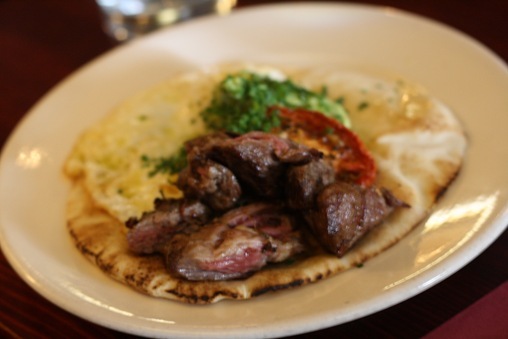 Love the idea of meat and eggs piled on top of a pita. How can you go wrong with that? 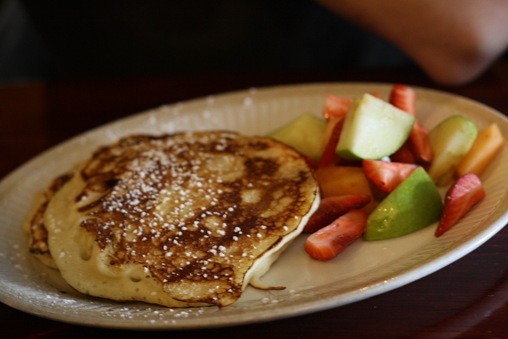 Colin, the pancake connoisseur, got the banana pancakes. Also acceptable, a self-induced sugar coma on your birthday. 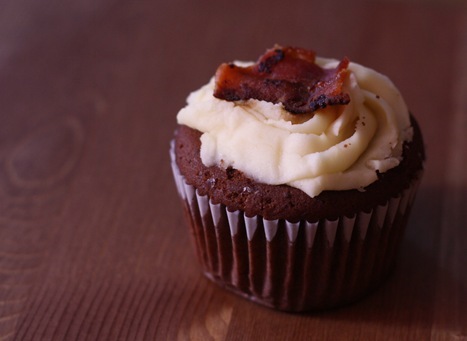 Thank you Callie for the chocolate cupcakes with bacon and a maple buttercream frosting! These were my second cupcakes by Callie (first being these green tea cupcakes with a sweet red bean paste). I’ve decided that she is the cupcake queen. Uh-mazing. Not too fluffy, not too sweet, a subtle maple flavour and just the right amount of frosting. And of course, bacon makes everything better. There may have also been mass quantities of Fluffernutter Birthday Pie. Who needs cake? The best part about a weekend birthday is eating peanut butter marshmallow pie on Saturday and Sunday. Including as a post-bar snack at 3am. I had high hopes of going to yoga today, but after brunch I collapsed and watched Breaking Bad all day. Relaxed and low-key, just the way I like it. Well, you know, apart from the huge blogger meet-up on Saturday followed by a bottle of whiskey with my Maritime friends. Right. I’ll get to some of that later. For now, I’ve got to soak up the last few hours of my special day and look into investing in some wrinkle cream. Gah! I’m a quarter century! Question of the Day: What’s your favourite way to celebrate your birthday? And more importantly – what do you like to eat!? Posted on January 23, 2011, in Restaurants and tagged brunch, camera, coffee, pie, Restaurants, Toronto. Bookmark the permalink. 38 Comments. Looks like a great birthday Susan! And I don’t think you need to worry about wrinkle cream just yet. ;) I love your gorrillapod. Someone had one at work a while ago and at the time I had no idea what it was for but now I want one! Have a great night! I’ll save you some of the cups! And the restaurant sign is hilarious. I’ve been making fun of it every time I walk by it for months now :P Love you! Happy birthday! Those desserts sound terrific; I would definitely dig in on my birthday, too. I won a blogger babes calender from Janetha that’s hanging on the wall and had to pop over to check out your blog. Great photos! That fluffernutter pie looks divine! I’m curious to see some of the exercises in that book…it looks interesting. Ooooh that food all looks so delicious! Looks like a good day. Happy birthday! Nice restaurant, good movie, and cherry chip vanilla cake (with peppermint ice cream). Happy birthday! 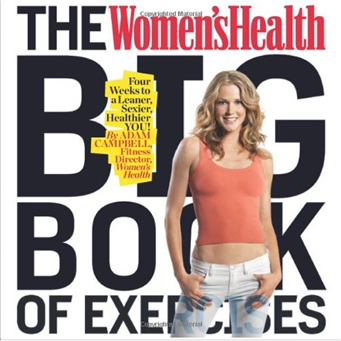 I love the Women’s Health exercise book, it’s amazing! 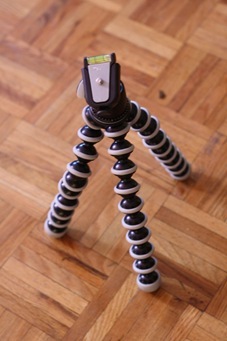 Where do you get a gorillapod? Henry’s Camera near Church & Queen. Although, I bet you can find it cheaper online, it was $100 in store. 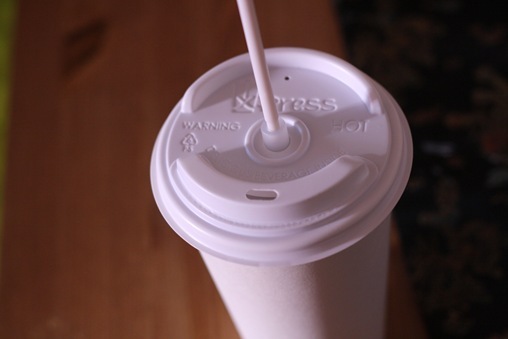 Make sure you look for one with the swivel top! Enjoy the gorillapod! I had fun with mine until I broke it LOL! Breaking bad is awesome! We watched all of those via netflix. Excellent acting. I have eaten some pretty strange post-bar snacks myself lately- nothing as delicious as peanut butter marshmallow pie, though! Hope it was a great one! Happy birthday Susan! 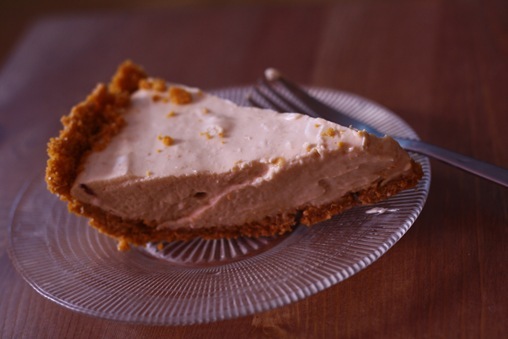 Peanut butter pie- that would be my fave. My fave way to spend my birthday would have been to have a massage and not stand over my sick kitty as I did the other day (and drive her 300 miles to and from our trusted vet). Yeah, I’m getting a massage next week for SURE! mass quantities of Fluffernutter Birthday Pie = NICE!!! HAPPY BDAY!! Somehow in the shuffle of life, this kinda slipped by and i read every single post of yours. So happy bday! Happy Birthday! I hope you post a review of your new book! It looks fantastic! one last HAPPY BIRTHDAY wish from me to you! i am so glad you had a great birthday weekend. you are adorable. yay for the french press cups! i use the cute houndstooth sleeve you got me for mine because the cup gets so darn hot. did you ever get the christmas package? i totally forgot to ask you about that! and there should be another one coming your way.. keep an eye out! Hmm… I never did get a Christmas package. Maybe I’ll stop by the post office and check it out – the slip may have gotten lost while I was gone over the holidays. I’m excited to see what’s in it! I marked my “blogger calendar” with you as Miss January, fittingly so! You are such an awesome person, you deserve all the best. Truly, you are one of the few blogger I feel I’d hang out with in “real life”. I hope that doesnt sound creepy and its totally cool if you dont feel the same way! It’s funny. I read the menu before reading the rest of your post and had decided that if I was there I would have ordered the potato pancakes with smoked salmon. LOL I was drooling over the photo – yum! Happy Birthday!!! 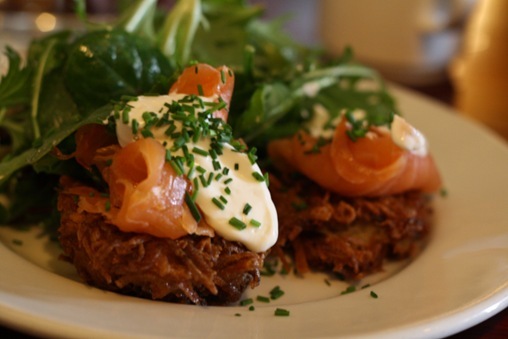 Also, the latke-smoked salmon dish looks amazing. 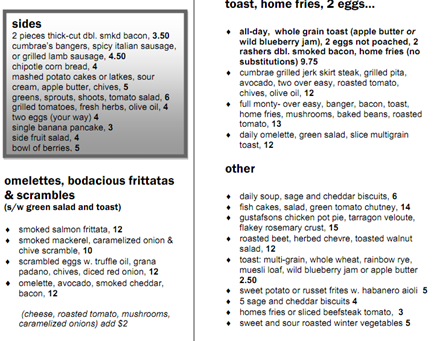 That brunch place looks AWESOME, what a cool menu!! Happy Birthday gorgeous! You’re right, who needs cake when you can have brunch and marshmallows? Hope you had a great birthday! 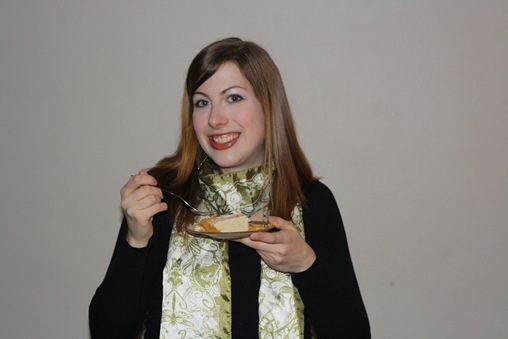 :) That brunch looked terrific and how can anyone go wrong with peanut butter pie??? My birthday is this week too! My mom always makes me lasagna (gf noodles!) which is my #1 favorite food. Not sure what my birthday dessert will be. Still deciding. My husband will be out of town so he’ll have to take me out when he gets home…it will be like having two birthdays! Happy Birthday Susan! This post is filled with great memories, companies and eats, I thoroughly enjoyed reading it! Btw – this is my first appearance (comment) on your blog. :) Enjoy reading your blog very much, and thanks for being yourself! Much love, Lush. Wow I love your roommate Megan’s meal. I am definitely going to try to whip up my own version. Yum!! Happy belated birthday! I like to just spend time with my family & friends- and I like to eat pasta and ice cream! i love that you take a personal day. they say it’s your birthday!!! happy birthday to ya! Really late, but better late than never, right?